Another interesting feature is that each character has their own abilities just like they did in Super Mario Bros. 2 USA! The game also features many new and returning power-up's including the new flagship power-up the Cat Suit which allows you to run fast, climb up walls, and use your claws against enemies! The legendary Super Leaf that grants the Tanooki Suit is also present in this title! This game has alot of content and is quite challenging to beat 100% so the replay value of the game is quite impressive! The Miiverse implementation is perfectly executed in this title and you can obtain ghost Mii data of other players via spotpass that allows you to play together with ghost Miis of other players in the game's levels to see how you stack-up against other players of the game! 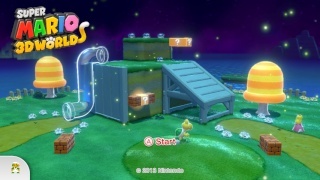 The controls in Super Mario 3D World are straightforward and easy to learn, but there are a few levels that require the gamepad to play such as the Captain Toad levels which require some strategy to beat. A few other levels require the gamepad for various reasons such as needing to blow in the mic or using the touch screen to progress through these levels which adds to the overall experience of this amazing Mario title! 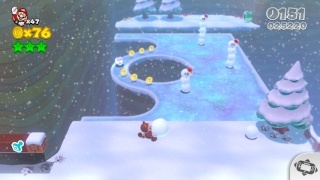 The graphics in Super Mario 3D World are vibrant and in full HD. The water glistens in the sun, the rain beads and slides down the lens of the in-game camera, etc. it all looks amazing and the character and enemy models look more impressive than ever before! 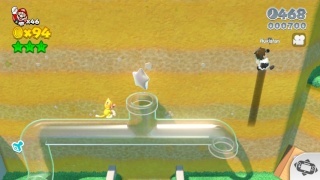 The level designs are also striking and have alot of impressive details making every level completely unique! The few cut-scenes in the game are also very nice looking as well as being humorous in their storytelling. Overall this game is gorgeous, but doesn't have quite the level of wow factor that Super Mario Galaxy possessed even though the graphics are far superior in Super Mario 3D World, but it's still breathtaking nonetheless! The sound effects in Super Mario 3D World are pretty much what you'd expect to hear in a Super Mario title which is simple yet effective, but this game, as is the case with most Mario titles it's the music that is what's impressive in the audio aspect of the game! The soundtrack is quite varied even for a Mario title and most of the music in the game is extremely impressive and fits the game well, but again the game though deserving of a perfect score doesn't quite have nearly as impressive of a soundtrack as the Super Mario Galaxy games possessed, but then again very few games on any console do. With amazing gameplay, excellent use of Miiverse, nearly perfect controls, gorgeous graphics, and an amazing soundtrack Super Mario 3D World is a nearly perfect game in every aspect, but even though it's deserving of its perfect score it doesn't quite reach the same level of perfection that the Super Mario Galaxy games possesed, but regardless this game is incredible and every Wii U owner should purchase this amazing Mario title! Whew I finally finished it! What do you think of this review? I tried to put much more effort into it than I usually do since I wanted to make this review worthy of a Nintendo seal of approval! Dang nice review dude, this might be your most impressive one yet! If you keep making your reviews this good you might become as good as Jnes5. Anywho I agree that this game is almost perfect but isn't quite as good as SMG or SMG2 though to be honest I'd give this game a 9/10 still it's a sweet game that I enjoy playing together with my wife and daughter! This is such a nice review boss. SM3DW is my favorite Wii U game so far! Great review FTW! I love Super Mario 3D World because it is such a fun game! This is a beautiful review @Rukiafan! Nice review once again @Rukiafan lol. Super Mario 3D World was the best game released all year! The only thing I can say is that this game deserves GoTY 2013. This so fun play with friends! I just want to let you know that this review is on page one of google search when you search Super Mario 3D World review! It is just below the Nintendolife review! I like this game, but I do not understand all of the praise it receives. It is good, but not great by Mario standards. 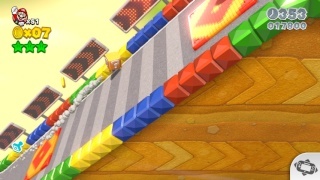 I hope Nintendo starts working on a new 3D Mario game that is more similar to Super Mario 64, but much larger in scale. This is a good game, but we need something as epic as Super Mario Galaxy! Nintendo is apparently considering a third SMG game for Wii U.
I'm giving some serious thought towards getting this before I pick up my Wii U from layby next month. I might get some more games as well, perhaps an online-enabled one! Thanks for all of the comments guys! You're all awesome. Nice review Rukia chan! This is such a fun Mario game. I especially love the cat power! Sweet review! This game has a totally retro vibe to it and I love it! This is an impressive review. This game deserves a high score, but I think a 10/10 is kind of high as I'd give it an 8 or a 9, but the format of your new reviews is very tidy and looks great! That was a fun read! While I agree that the game is awesome I also agree with @FM_Alchemist that the game isn't perfect. This is a great review of Super Mario 3D World the game is excellent as well! Superb review! I fully agree with the score this is one heckofagame! Who liked this game more than Super Mario 3D Land? This game was great! Such good review the game is as good as you say it is @Rukiafan! Your reviews just keep getting better keep at it Rukes. I still don't have this game but it's high on my must buy list of games. Superb review. 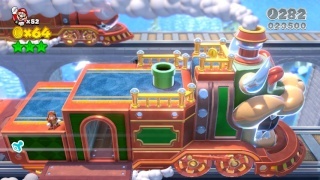 Super Mario 3D World is best played with friends so if you have only played solo your opinion of the game will be much more negative.